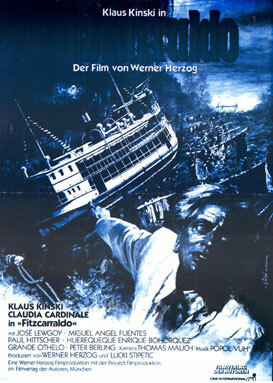 German director Werner Herzog has the kind of faith that can move mountains…..or at least a 340 ton steam boat over one. In his visually breath taking and logistically mind boggling film Fitzcaraldo, he does exactly this using hundreds of native Indians pushing primitive wooden winches in deepest darkest Peru. It’s a feat accomplished by the sheer force of will of his eponymous central character who, like Herzog himself, is an incorrigible dreamer. In fact, had he not been able to secure the services of an actor prepared to spend months living in a remote jungle camp, Herzog would’ve taken on the part himself just to see the project realised. Jack Nicholson was his first choice then Jason Robards took on the role with Mick Jagger cast as his sidekick. But when Robards pulled out, Herzog resorted to the man he calls his “best fiend”, the brilliant but by all accounts severely deranged Klaus Kinski. With his shock of erect bleached blond hair and his wild blue eyes, Kinski is simply stunning as the obsessed opera freak who heads off up the Amazon in 1906 to a tributary that will lead him to an unclaimed rubber tree coup. By plundering its untapped resource, he plans to raise enough money to build an opera house in the backwater town of Iquitos. The only hitch is that to do so he has to haul his ship over a mountain to avoid impassable rapids. Herzog revisits the many obstacles that he faced making this masterpiece in the commentary he provides on the DVD. At one point the Indian chief offered to murder Kinski for him and he admits to seriously considering it. This was their fourth film together and although it was a nightmare to make, the results are some of cinema’s finest.